Musica has two formal dining rooms with early and late dinner seatings, L'Oleandro and Le Maxim's. Lunch is served in the dining rooms as well. Impressively, there are plenty of two- and three-tops. The dining rooms seem massive, but at our table for two, we felt quite cozy. The food on Musica is uneven. I know this won't surprise folks at MSC. In fact, they're trying to fix it. But the truth of the matter is that a wildly successful entree one night -- the Sorrento-style pork piccatas with fresh tomato and mozzarella and the beef tournedos come to mind -- might be followed by a bomb: roast guinea fowl that's overcooked, grainy and almost inedible, or a dry and sauceless Indian beef curry. And, with the exception of the appetizers, which are creatively crafted, there's a "who cares?" element to the presentation. Offsetting that is top-of-the-line service from the waitstaff, who are both gracious and flexible. One night, for example, our waiter happily created an entree for me from two of the appetizers. Another time, he located a bottle of wine that wasn't on the menu. As for the menus, they are robust: three appetizers; a salad of the day; a couple of soup choices; a pasta and risotto; four main courses; three vegetables; bread; and desserts. As if that weren't enough, each dinner menu features an international specialty; two vegetarian selections; two low-calorie alternatives; and, each night, a different offering from regions throughout Italy. Then there is the "Always Available" menu, which includes spaghetti and grilled chicken, beefsteak or salmon. The wine list is also impressive at just under 100 bottles. Note: Musica offers an "MSC Wine Package" featuring various combinations of wine and bottled water, starting at 75 euros (about $100). To its credit, Musica has an excellent alternative restaurants: Kaito Sushi Bar, which operates from noon to 4 p.m. and from 6 p.m. to midnight. I can't say enough about Kaito, which is priced according to item. Our lunch for two -- a seafood and vegetable tempura, chicken teriyaki and two glasses of wine -- was 30 euros (about $39). It's the same menu, lunch and dinner. Reservations are recommended. Breakfast and lunch are served buffet-style in the Gli Archi cafeteria. You can get eggs cooked to order at breakfast. There's a fruit bar, a yogurt and cereal station, an island with cheeses and cold cuts, and a bar serving up to a dozen kinds of bread. Lunch is something else: a hamburger and hot dog grill, a pizzeria, a wonderful salad and fruit bar and hot menu items such as roast veal, beef stroganoff, stuffed pork, meatballs, fried fish, Portuguese green beans, potatoes and zucchini. We found that by sticking to salads and fruit, you couldn't miss. A heads up: The two buffet lines, on either side of the cafeteria, have different offerings. Foolishly, it took us days to figure that out. One of the nicer things about the buffet is the ability to dine outside on the pool deck. It's not nearly as frantic as the cafeteria, and with the strains of classical music piped in over a sound system, it can be quite enjoyable. 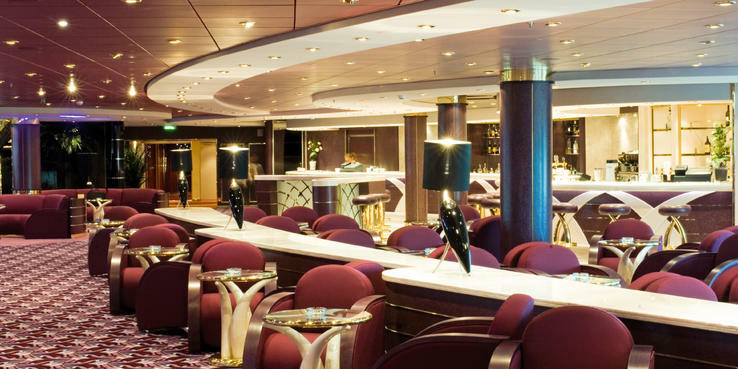 At 11:45 each night, there is somewhere onboard a complimentary themed buffet -- canapes, fruit flambe, pasta, crepes flambe, snacks. On certain nights in the Gli Archi cafeteria, as highlighted in the daily program, there's an a la carte pizzeria, priced per item. Room service, consisting basically of light fare, is available 24 hours. Continental breakfast is served free of charge. Otherwise -- and this is more common on European lines than it is on American ones -- the seven items on the menu -- sandwiches, salads, a cheese and fruit tray, and the dessert of the day -- cost roughly 3 euros each (about $4).